Dolphins are social animals living in the wild. They need space much ambler than a small pool in the aquarium. If you truly love dolphins, can you bear to see dolphins being forced to perform tricks, something they do not perform naturally? 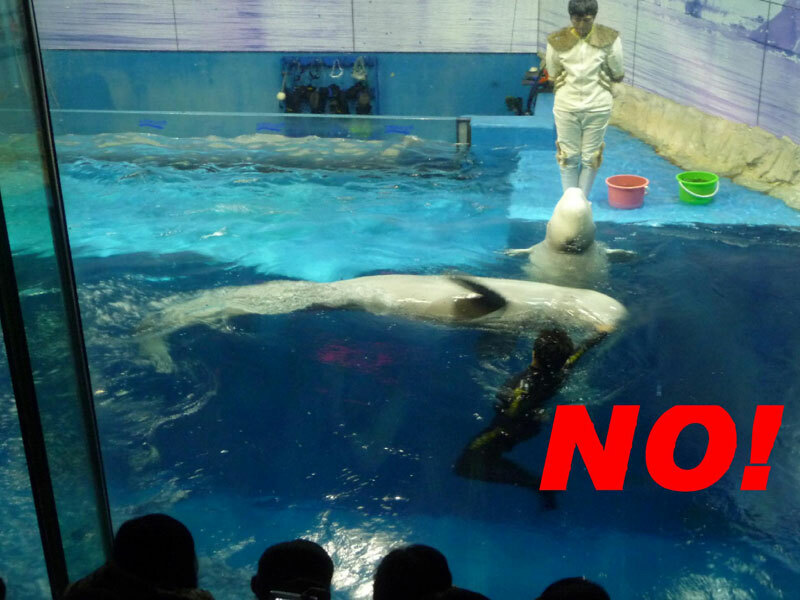 Can you bear it to see mother and calf dolphins being separated, with the calf being sold at a high price to aquariums in different parts of the world where they have to perform meaningless tricks? Boycotting aquariums where animals are forced to perform for a profit can help to reduce demand for this kind of activities, and hence the motives for aquariums to buy more animals. 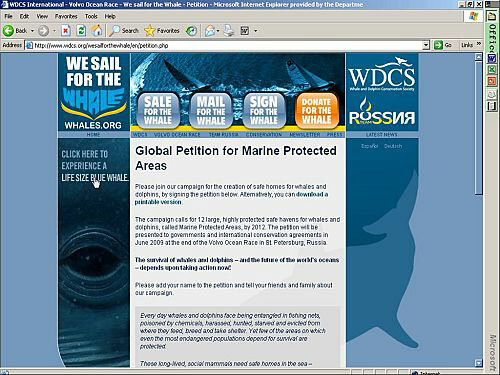 Although whaling is banned in most places, Japan, Norway, Iceland, Danish Faroe Island etc. 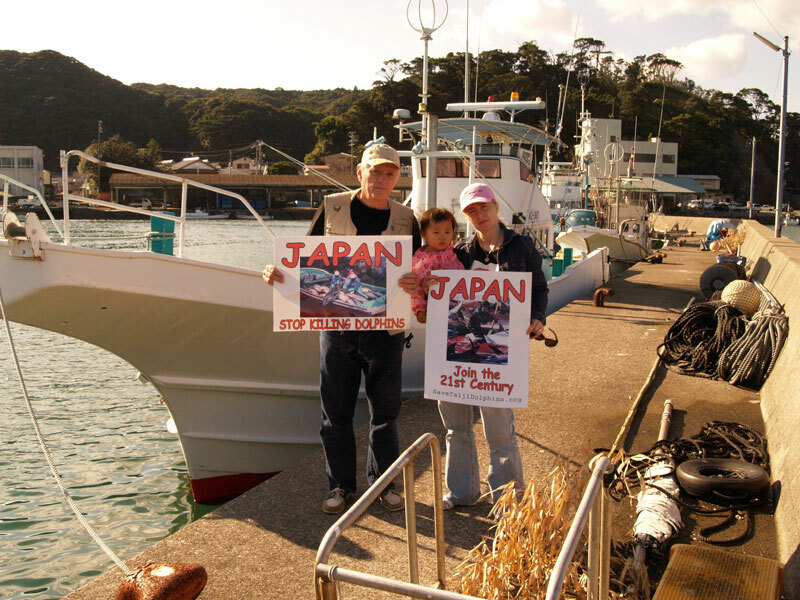 continue to hunt whales and dolphins. From time to time, they seek to expand the whaling quota, hence posing whales and dolphins, the population of which is already heavily depleted by whaling, with greater threats. Say “NO” to whale meat in whichever part of the world. If you eat whale or dolphin meat, you are creating a demand which supports the unsustainable whaling practice. It is not good for your health either. When you visit a whaling county, boycott restaurants or stores that sell whale meat. Why is it harmful to eat whale meat? Whales and dolphins are divided into two large groups base on the way they feed. They are namely baleen whales (filter food with baleens) and toothed whales (catch fish with teeth). Baleen whales feed on planktons like krills and small fish, which are basically near to the bottom of the marine food chain. Toothed whales feed on larger fish up the marine food chain. Due to marine pollution, marine animals at the upper part of the marine food chain accumulate more pollutants (e.g. heavy metal like mercury and organochlorine) from their food. The whale meat sold at the Japanese markets includes meat from both baleen whales and toothed whales. But it is always difficult to tell from which type of whales the meat is from by just looking at the meat. As an individual, apart from sending our letter of protest to our own government, requesting them to vote against whaling at the International Whaling Commission, we can vote by our feet. We can stop visiting whaling nations – Japan, Norway, Iceland and Denmark. If everybody do the same and stop visiting whaling nations, the foreign currencies brought in by visitors will reduce, thus pressurizing those nations to stop whaling. In late March 2009, ATV of Hong Kong broadcast a trailer featuring the programme hostess enjoying whale meat in Japan. This is kind of promoting whale meat consumption. “It is noticed from the trailer on ATV that a program will be broadcasted on 5 April 2009 at 8:00 pm featuring the hostess eating whale meet in Japan. They are promoting their program with whale sashimi. I am lodging a complaint against this program as I find this disgusting. According to Schedule 2 of the Wild Animals Protection Ordinance (Cap 170), all cetaceans are protected. Cetaceans are protected by law in Hong Kong. Apart from some nations, countries all over the world have been working hard to promote cetacean conservation. Most people would condemn the disgusting acts of those who hunt whales for consumption by their people in the disguise of science. As there are many alternatives to whale meat, and with the results of the tests conducted by scientists, demand for whale meat in Japan has been decreasing. Yet, what this program is doing is to promote the consumption of whale meat, which increases its demand. This is contradictory to the anti-whaling efforts of the international arena, and it is detrimental to the image of Hong Kong. Apart from the cetacean conservation factor, eating whale meat is harmful to health. Many scientists, including Japanese scientists, had considered whale meat not suitable for consumption, due to the fact that whale meat is contaminated with high dose of heavy metal and organochlorine because of marine pollution. (Please refer to http://www.guardian.co.uk/world/2008/oct/16/japan-food) By broadcasting this program during prime time, and promoting whale meat that are contaminated with heavy metal and organochlorine, ATV is turning a blind eye to the well being of Hong Kong people. This prime time program features the hostess enjoy eating whale meat, praising that it is very delicious. Although it is not shot in Hong Kong and may not be governed by the laws of Hong Kong, the program is nevertheless produced by Hong Kong people, hosted by Hong Kong people and broadcasted in the territory. What would Hong Kong people think about this? Seeing the hostess enjoying the whale meat, those who do not know the fact would want to have a try. 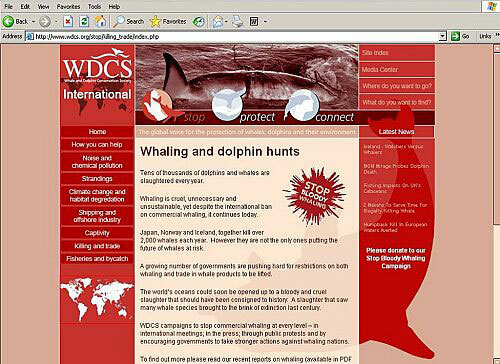 What ATV is doing is to promote eating whale meat! The role of the mass media is to convey correct messages. The purpose of this kind of gourmet program is to promote delicious food, instead of this kind of so-called “food” that are harmful to health and violate the principles of conservation. It is inappropriate to convey incorrect messages to the public. We urge you to take this matter seriously by asking ATV to delete the whale-eating episode and stop promoting the program with the episode. 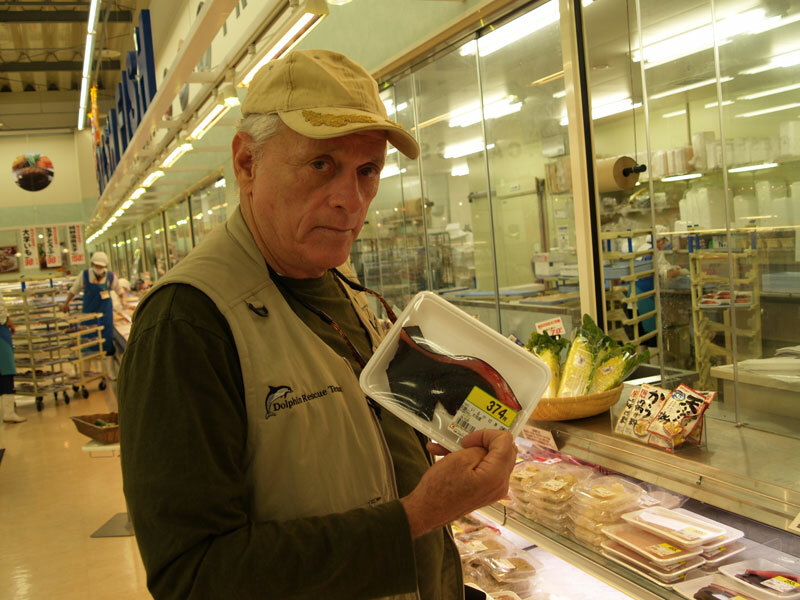 With the support from the public, the whale meat episode was deleted from the programme before it was broadcasted. 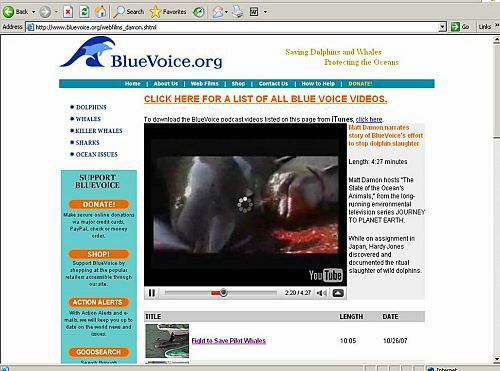 An audio-video magazine had once published a photo featuring a model riding on a stranded whale posing happily. In the 16 February issue of AV Magazine under the “AV Face” section (Page 56, please see attached document), it features a photo of artist Kathy Chow sitting on a pilot whale. The photo depicts the artist sitting on a half-stranded whale, adding weight on it, and posing happily. After seeing this photo, we find it totally unacceptable and we are disgusted with it. Cetaceans relies on the buoyancy of water to support their body weight. They will undergo extra pressure in shallow water. If a stranded whale or dolphin cannot get back to deeper water on time, their internal organs will be damaged by the weight due to gravity, which can be fatal. At this moment, if somebody sits on the whale adding to the weight, the whale will have to bear extra pain. According to Section 3 of the Prevention of Cruelty to Animals Ordinance (Cap 169), it is in violation of law to treat any animal cruelly or permits any unnecessary suffering to be so caused to any animal. Although we believe that this photo was not taken in Hong Kong, yet, this magazine is published in Hong Kong. It is unacceptable that the editors of AV Magazine allow a photo depicting an artist cruelly treating an animal happily. This would mislead the public of Hong Kong, making them think there is nothing wrong with such act. If everybody follow suit, more animals (not only cetaceans) may have to bear unnecessary pains. We hope your department can issue a warning to AV Magazine, requesting them to clarify the case in their next issue, pointing out that it is inappropriate for the artist to do so. Apart from this, we hope that the Animal Welfare Advisory Group and Animal Management Division of AFCD to pay more attention to this issue and ask the artist concerned not to act this way again. We believe that a responsible media should convey correct messages to the public. Thank you. Regarding the photograph published on page 56 or the AV Magazine Issue 241, no sufficient evidence found to prove that animals were treated with cruelty. We have written to the magazine to remind them that such photograph is not advisable for publication.